Logan: Can I have some milk? Me (pouring milk into a blue sippy cup): Here ya go, Sweetie! Logan: No, NOT THE BLUE CUP! I want the green cup! Me: That is not how we ask for something. Logan: Please GIVE ME GREEEEEN CUUUUUP!!! Me (Sigh. So glad I went to college. ): Here is the green cup. Logan: THIS IS NOT THE BLUUUUUE CUP!!! I quickly attributed this psychosis to something called Cognitive Dissonance, which is a fancy way of saying “buyer’s remorse.” Basically, if you are choosing one thing, then by default, you are rejecting something else. And that something else suddenly is way more appealing. Considering it took me about four months to commit to what color diaper bag I wanted, I sort of got his point. Sometimes too many choices make you cry. After about the tenth one of these meltdowns, I made a public declaration that if I were to ever have another child, that child would be given all the cup choices of Soviet Russia: one color, one choice, end of story. And to give myself credit, this plan worked pretty well for us. For a while. A couple years ago I discovered these wonderful monogrammed melamine plates from La Plates, just the perfect thing for outdoor dining. Choosing which combination to go with harkened me back to the Blue Cup, Green Cup years, except with an infinite number of combinations this time around. I decided (against my better judgement and control freak nature) that I would allow each family member to choose their own design. As much as this pained me, I knew if I had this burden of choice entirely on my shoulders, we’d still be eating off of paper plates. 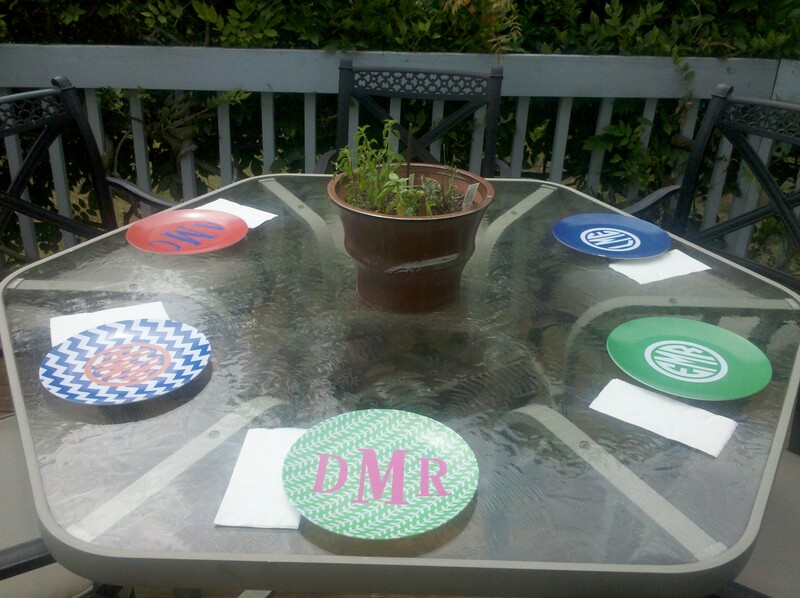 This entry was posted in Life and tagged kids, melamine, monogrammed, outdoor dining, plates by Mom Mom's Apron. Bookmark the permalink.